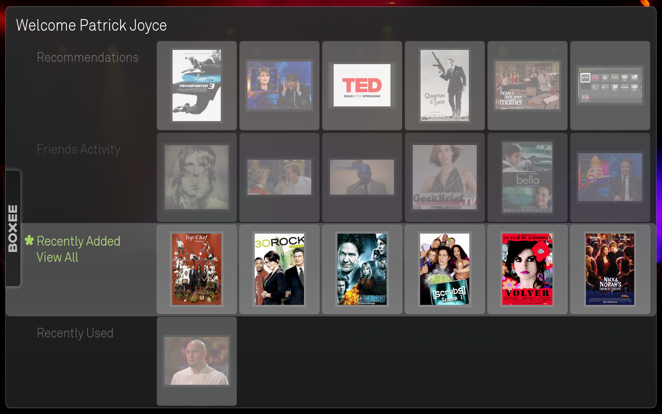 Boxee is a fork of the excellent XBMC media player that runs on Macs, AppleTVs and Linux. It provides a great remote control based interface for accessing your stored video, music, and photo libraries on your TV, as well as providing site specific browsers for viewing media from the internet sources like YouTube, Comedy Central, the BBC, CNN, Last.fm, Flickr, Picassa, and, at least for a few more days, Hulu. For a more in depth introduction check out this New York Times article. 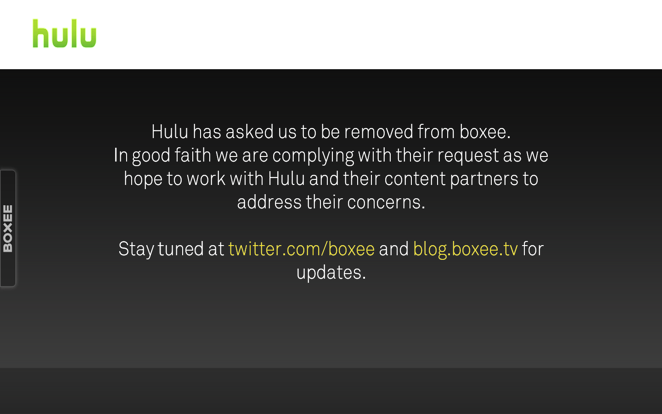 Hulu recently announced that they were being asked by their content providers to cut off access to Boxee. So as of about 20 minutes ago, you can’t access Hulu via boxee. A lot of people, myself included, are really annoyed at this. I think that Marc Hedlund pretty much nailed it. Basically, the studios are worried about anything that makes it easy for the general public to view video content on their TVs over the Internet. Never mind that this is what people want, or that there I can and will still watch Hulu on my TV (see Fred Wilson’s take). The studios are worried about the cannibalization of their television audience. Hulu has ads, but television ads are much more lucrative. The studios are going to protect that market, at all costs, for as long as they can. I think that the studios are being short sighted and incredibly stupid, but I’m going to choose to focus on another question: Why are TV ads more profitable than video ads in a Hulu stream on a per impression basis? Television is fundamentally a mass media. Everyone watching a TV show gets the same ads (well, mostly, but not exactly as local affiliates and cable providers do insert certain local ads) But there are fundamental limitation on how well they know their audience. Simply put, there is no way to know who is watching the ad, so the best they can do is target the demographic average. Never are the limitations of this approach more clear than when you watch a show for which you are clearly not the normal viewer. Let’s call it the “Top Chef Problem”. I watch Top Chef. There. I said it. I find the reality show portions pretty annoying, but I love food, love cooking, and damn if that show isn’t entertaining. However, watching the ads makes it really clear that I’m not their target audience— women with children are. So the vast majority of ads are a complete waste on me. I’m not buying beauty products or minivans. There is no way that I’m going to watch the Real Housewives of Orange County, so they might as well stop advertising it to me. But, since with TV ads there is no way to know that I’m a 27 year old straight man who happens to love cooking and drinking, they keep showing me ads I have no interest in, and Dove Body Wash keeps paying for ads that have no chance of turning me into a consumer. What about Internet Video Ads. Unfortunately, the state of the art seems in Internet Video Ads seems to be roughly equivalent to that of TV advertising. Actually, it could be even a little worse. Last night, I watched a few streaming episodes of South Park last (from Comedy Central via Boxee). I saw the same ad for Jack In The Box over and over. I live in Maryland. The closest Jack In The Box is in North Carolina. Jack In The Box paid for an ad that has absolutely no chance of converting me to a customer. My location. Geolocation isn’t that tough. Looking up my IP gives my location within 2 miles. No more Jack In The Box ads. My ISP. At my present location, Comcast. Why then does Hulu regularly show me ads for Comcast High Speed Internet when I watch Hulu over Comcast internet. They know I use a Mac. Probably not a ton of use in showing me ads for the Zune. Sorry, Microsoft. What I watch. Based on my cookie they know what other shows I watch on Hulu. This isn’t even taking into account the truly scary amount of data that Double Click / Google / Facebook have accumulated about me on my travels across the web. Lets go back to the “Top Chef Problem”. Imagine what they could do with all that information. No more ads for minivans. No more ads for makeup. No more ads for easy to prepare meals for kids. Instead, they show me ads for local restaurants, wine and beer. Ads this targeted have to be worth much more, per view, to advertisers. So it would reason that advertisers would pay more per view for them. So even though internet video will need to include fewer ads than traditional television (to effectively compete with bittorrent / other sites that don’t have any ads) the studios could still make just as much money, or more, per view than by selling more expensive ads. Wouldn’t it be more productive for media companies to spend their time and money investing in advertising technology then engaging in a Sisyphian struggle to protect the staus quo? The future of video entertainment is on demand. The media companies aren’t going to be able to continue to extract rents (meant in the economic sense) from controlling distribution. In a digital world, once you release something people are going to be able to get it on the device they want. The only question is how the media companies figure out a way to make money off of that.